Cheese Curd Outlet PMO Mix Proof Valve - R-Cap Process Equipment, Inc. 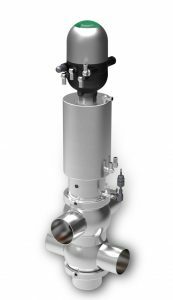 The large open throat of the Pentair Südmo Cheese Curd Outlet PMO Mix Proof Valve provides gentle handling of the curd, and allows particles of up to approximately 1.75 inches to pass unobstructed through the valve. Unlike traditional Mix Proof valves, the Cheese Curd Outlet Valve is specially designed for the United States cheese market with a larger than normal double seat valve leak detect port. The use of Mix Proof technology ensures safe separation of incompatible fluid media. Independent seat lifting allows seat cleaning with the corresponding line to ensure all product contact surfaces are 100% cleaned. As the inventor of the Cheese Curd Outlet Valve, Pentair Südmo not only has the technology, but we’ve had the time and experience to perfect it.